There are actually two different types of garbage disposal on the market: continuous feed – a more common choice – and batch feed. They are different from each other in aspects of mechanics and price. Let’s just cut the formality and get right into it, right into inspecting the two types and figure out which is best for which disposal situation of kitchen waste. If you’re new to the scene, there are still a few more things that should be looked at. Pay our Things to know about garbage disposal article a visit. It should be useful at some point in time. As the name suggests, continuous feed disposers may be fed… continuously. That’s pretty much it. The Insinkerator Badgers are the typical continuous feed disposal machines. In other words, the motor will keep on running and grinding as long as you don’t switch off. That way you can throw in piece by piece of your garbage, in case you want to get rid of your food waste while you’re preparing meals, or when the volume of after-meal remains is too large. I know it does sound a bit obvious. Like why would you do it otherwise? 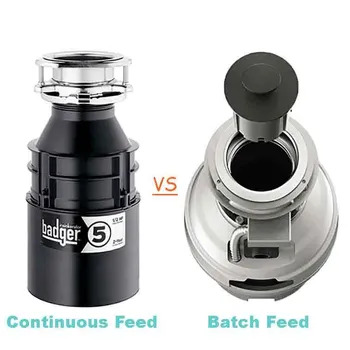 Why would you need batch feed? It’s because continuous feed has it strengths and weakness. Let’s sum them up. Best against an extensive amount of waste. Similar to other things, we’d like to divide substantial work into small parts and deal with it gradually. It’s just easier that way. Keeping an organized, clean looking counter top. Imagine peels, bones, etc. being piled up next to you while you’re prepping your food. Instead, just shove them straight down the sink hole, one piece at the time. There are many models to pick and choose. Since continuous feed disposers are the first kind, more popular and sold better, companies focus more on them. Meaning, customers can browse through the huge collection for the most suitable units. Prone to accidents. As the sink hole is always open and the machine runs non-stop, random things can enter the chamber if one is not careful. It could be a metal spoon or a coin or, most unfortunately, someone’s hand. Excessive use of water might be an issue. It’s recommended by manufacturers that cold water should be kept running in order for the machines to perform at their best. So the water bill is something to keep an eye on. Hard to control power usage. As the machine will run until you turn it off. If you forget to turn it off when it’s not needed, there will be unproductive consumption of energy. Again, the name says it all. Rather than operating on and on once switched on, batch feed garbage disposals are activated in a different way. The drain cover/ stopper acts similar to a activation key. Most of batch feed will only run when the drain cover is in its place. With this mechanics, you can turn the machine on, fill the chamber up with unwanted bits and THEN start grinding by putting the drain cover in. There should not be any concerns over foreign objects falling in either. If they do, somehow, fall in, simply reach in or use pliers or tongs to pick them out safely. Apart from that, when you have only a small pile of waste, you really don’t need to keep the motor running on and on. Instead, the pile should be throw in and shred in one instance. Such method should reserve energy and water. However, there are upsides, and there are downsides. We move on to the pros and cons summary. The cover/ stopper protects! As mentioned earlier, there is literally no chance of accidental crushing thanks to the safety feature. Control over power/ water usage. Clearly, resource management should be easier. You only need to smoothen the occasional process with water for that one time, unlike continuous feed. More expensive. Because the type lets and suggests you stuff the chamber before grinding, the motor have to be stronger to deal with a batch of stuff in one go. Plus, a noise-suppressive system is needed to deal with the loud buzzing. Possible health hazard. It seems ideal sometimes to wait until the chamber is full before running the machine. That means small amount of not-yet-time-to-grind garbage may sit in overnight or days, which may attract bacteria when the remains start to rot.